MT Merchandise Truck - Roll-A-Way Conveyors Inc. 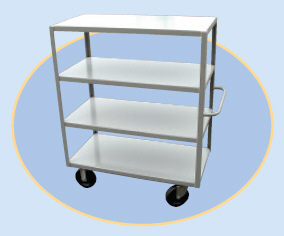 Merchandise trucks are equipped with 4 shelves, 8” x 2” Plexite phenolic resin wheels. 12 gauge all welded steel construction. Flush with edges down shelves are standard. Options include bumpers, optional wheels and stainless upon request. Powder coated grey. Overall height 60”.